The weather was indeed foul (pun intended!) for Raptor Watching at Hawk Cliff, but our Leaders, Ian & Gavin certainly did not disappoint on our very first birding trek hosted by the Ontario Field Naturalists. As the rain came down upon Hawk Cliff, we ventured off to the Port Stanley Sewage Lagoons where we encountered several beautiful birds. From there we went to Port Stanley Harbour where we did spot a gorgeous Bald Eagle! We then went back to Hawk Cliff where a Sharp-shinned Hawk flew through “Sharpie Alley” and a Red-tailed Hawk made a brief, close encounter appearance as we were watching a Yellow-rumped Warbler in the brush. 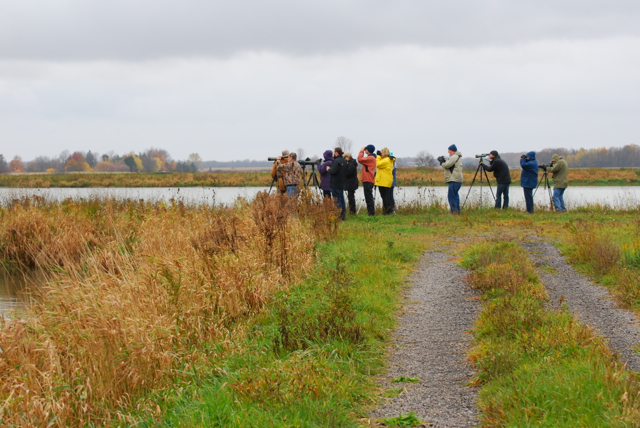 The day ended in the cool rain at the Aylmer Sewage Lagoons where a Red-necked Phalarope captured all of our attention. A very special thanks to the Guides Ian and Gavin. We would have never been able to spot, nor identify so many birds without your help and expertise. For our bird list and photos – visit the “Field Trips” reports page.